Actually, this is a more serious (albeit, only slightly) effort to reproduce what Arthur's "knights" looked like. Constantine III took most of the Roman soldiers stationed in Britain with him when he left to pursue imperial dreams in Gaul. The post-Roman Britons were left with the apparatus of the Roman state but precious few soldiers to protect the wealthy island. This unit is based on the assumption that the units following Constantine III left behind some cadre troops to train replacements. 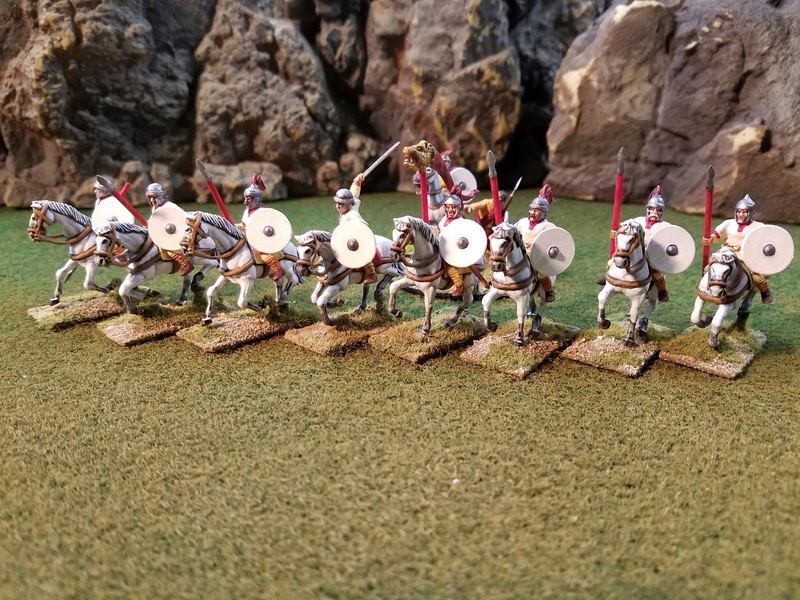 My assumption extends to the Britons taking over such troops as a going concern and attempting to build a self-defense force from the remnants. 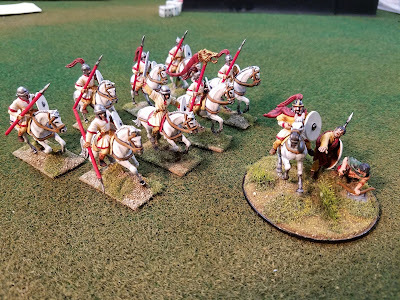 I have depicted them as light cavalry for two reasons; the breeding of heavy war-horses needed to carry heavily armored soldiers is a slow and costly business while the nature of warfare in post-Roman Briton required fast reacting cavalry to meet the raids of the English invaders which is a job better suited to light cavalry. 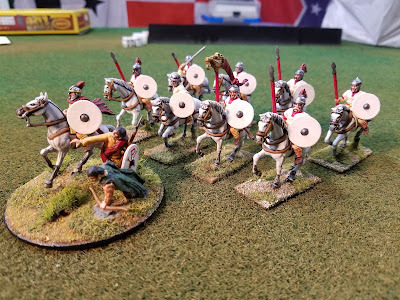 The weight of the cavalry is less important when your opponent is a strictly infantry force which the invading English were. 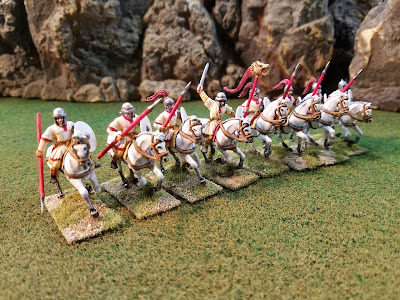 These troops were built using Gripping Beast Dark Ages Cavalry boxed set which I reviewed here. I do plan on building a force of Late Roman heavy cavalry to cover the possibility that enough heavy horses and armored soldiers were left behind to form at least one solid unit of cavalry. all of the mounts being white is in substitute for the lack of "shining armor"
Great stuff! The cavalry seem to be sword and spear armed. Do any of the figures have bows? 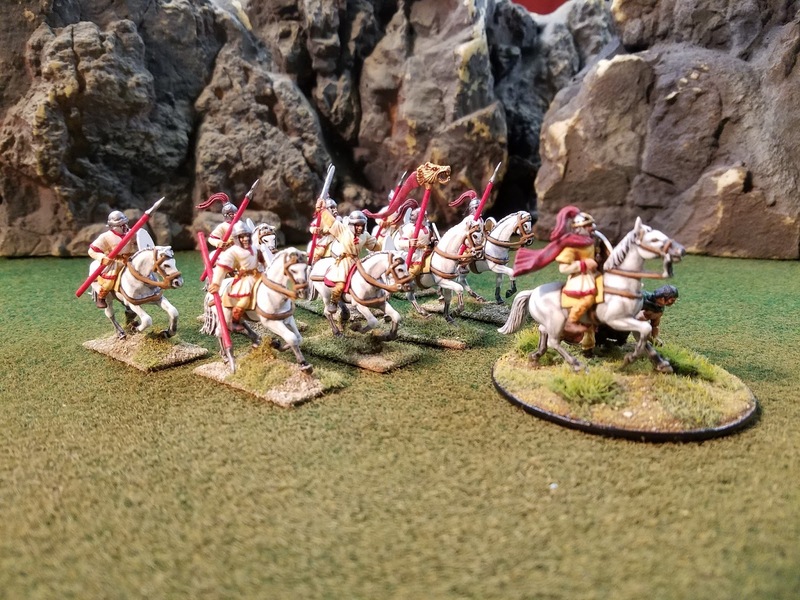 When you do the heavy cavalry, will the unit look like Arthur's knights in the movie King Arthur? I'm also looking forward to seeing how you handle your infantry. None of the figures in the Gripping Beast box are bow-armed. 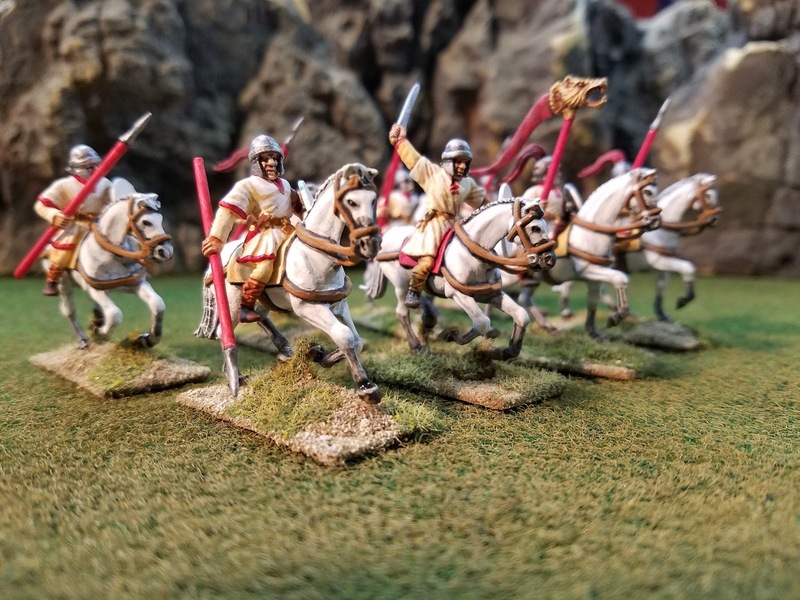 I haven't seen any references that indicate bow-armed cavalry in Britain at the time of Arthur (but I will admit my research has been rather superficial). I finished the Roman-style foot a little while back (check in the older posts, about three weeks back IIRC) and I am hunting around for some figures to use as Welsh archers and various militia types. 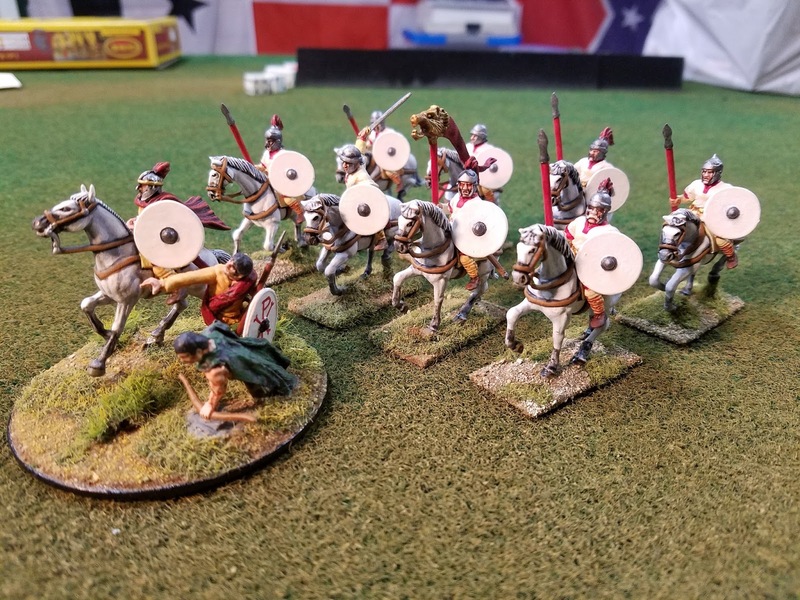 check out Footsore Miniatures.. Great stuff. I bought from them. A perfect day to say "May the 4th be with you", and it appears it is so, nicely down little unit there.